This sure is an interesting build. Know the feeling of what happens when trying to rush something. Been there and done that. So usually I never spend more than two hours at a time in the garage even if things seem to be going smoothly. You're off to a good start Kim, despite the little mishap with the front wheel. Happens to all of us, all you can do is take it in stride and move ahead. Thanks for the kind words Vince and Bill! With just a few hours of shop time today, I bored out another inch of the 3.25" DOM tubing that I'm using for the front wheels. This time, instead of using the parting tool, I took it to the bandsaw. Unfortunately, the piece was too short to be clamped the normal way, so I got creative. I clamped it against the back with a piece of bar stock, and used a Kant-Twist clamp with a little scrap rod, to hold it to the base. I was VERY careful to make sure I wouldn't cut through my clamp! To face these pieces to the correct length, I held them in the 3-jaw chuck. Unfortunately, the rim was so thin (1/16") that it slid down into the relief cut in the jaws and didn't provide good parallelism to work from. I tried several things, but the thing that finally worked was to use some 1/2" parallel's and Ty-wrap them in place so they wouldn't go flying. I ran things slow and stayed FAR away from the trajectory path, in case anything came flying off. But it worked. 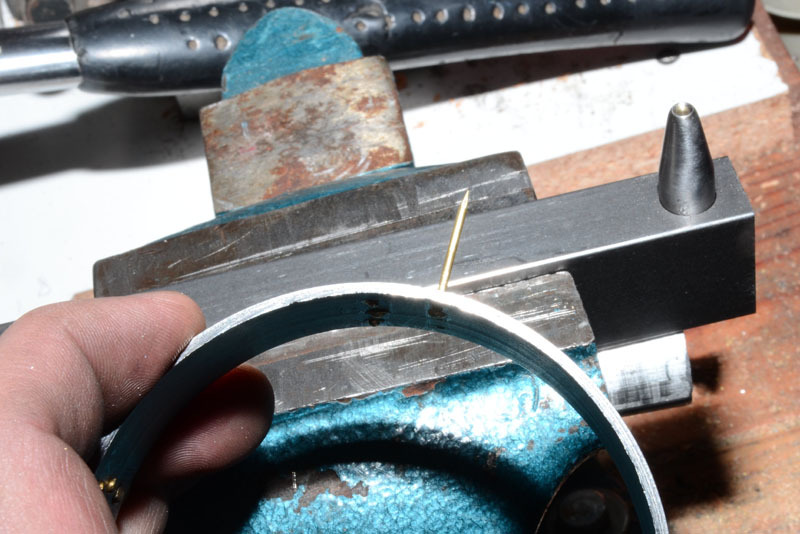 I did try my normal way of setting things square, then removing the parallels before running, but with so little to clamp onto, and with how stubborn this metal is, the ring would always creep about. Thus, I ended up with this method to leave the parallels in. And here are the outer rim for all four wheels. Still lots of work to do on the wheels. But I'm moving along! 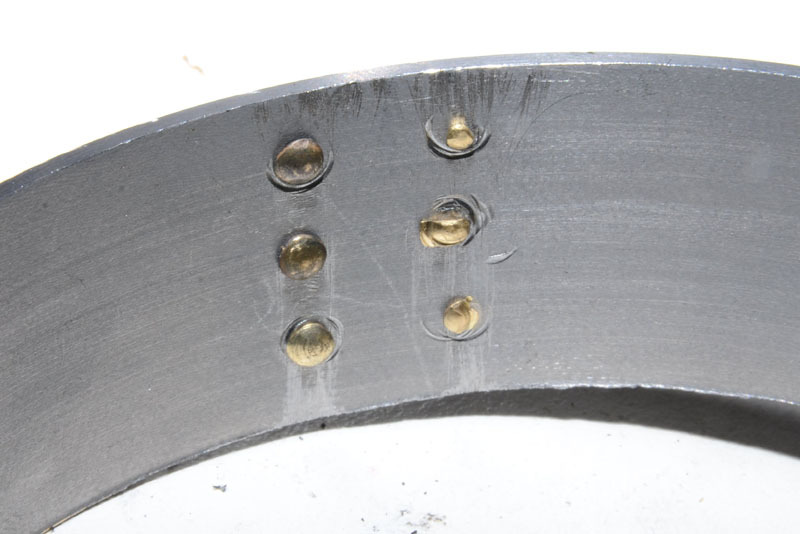 For today's shop time, I decided to see if I could figure out how to do rivets. There is a LOT of riveting to be done on this steam tractor, and that's something I've never done before. Rudy recommends using 18 GA brass escutcheon pins. I had to look that up. Turns out, they're little brass brads. I had a bunch, but not the right size. So I did an Amazon search and had some delivered. They arrived last night. So, of course, I had to play with them today! I've been reading up on how to set a rivet. The best info I found was in Stan's PMR Horizontal Boiler build log (here: http://www.modelenginemaker.com/index.php/topic,2360.msg39244.html#msg39244 ). The first thing I had to do was to make a riveting tool. So I pulled out some 3/8" W-1 and turned up these two items. The short one is for the anvil, and the long one is to pound the rivet from the top. 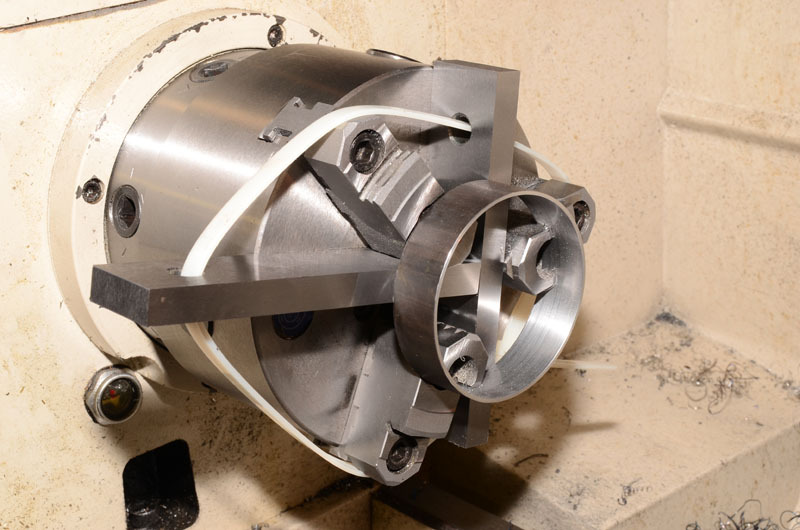 The concave area was made using a 1/8" ball end mill in the lathe. Then I did another thing I'm not too experienced at: heat treating! I used my Bernzomatic torch to heat up the part as best I could. The smaller part, the anvil was easier to do, but the long rivet set tool took a long time to get up to temperature, and even then I'm not certain I got it as bright as the smaller piece. In any case, it seems to have done OK. After the hardening, I tempered them, by bringing them up to a lower temperature (not as nearly as bright red - incredible accuracy here, eh?) and letting it cool down to room temp slowly. While they were cooling, I drilled a 3/8" hole in a length of 5/8"x1" steel to hold the anvil. With that, my rivet setting tool was ready to try. I forgot to take pictures while I was doing it, but I tried setting a few rivets. 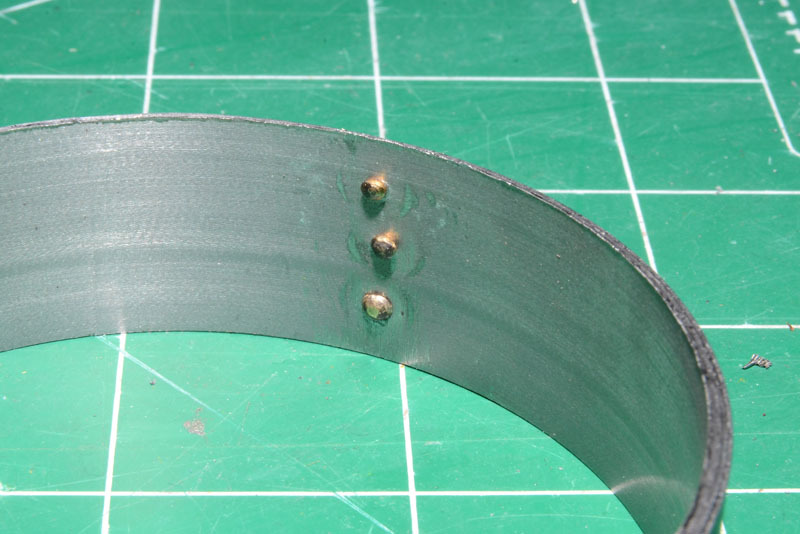 First, I drilled a few #55 holes in a scrap piece of steel tubing. Then used the anvil on one side and the setting tool on the other. It actually worked pretty well! But I'm going to have to wear hearing protection next time - I forgot this, despite Stan's stern warning in his aforementioned build log! 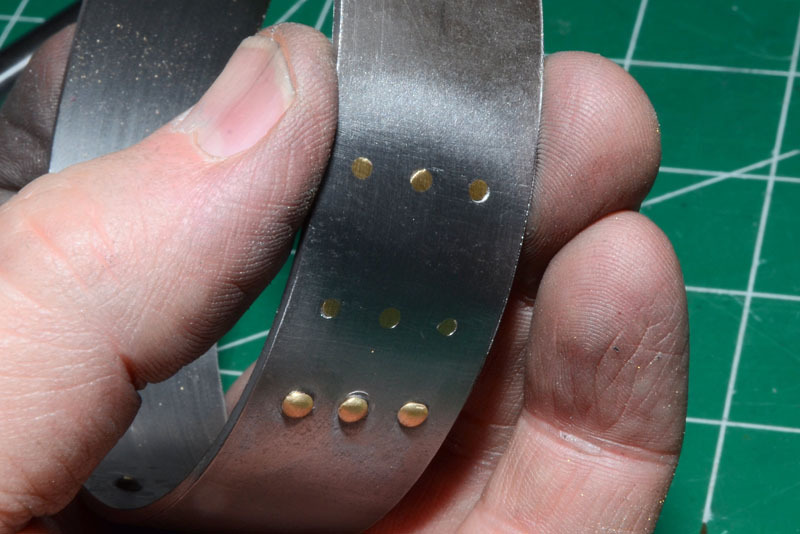 Here's the outside of the test rivets. The top one (first one I did) I placed the brass head of the pin inside the tube and formed the head on the outside. The bottom two were done the other way - putting the escutcheon pin in from the outside and forming the new head on the inside. I think the second is the right way to do it. Though either way looks like it will hold quite well, the pre-formed heads look MUCH more tidy. And here's the same test piece from the inside. I flipped the part over for this picture, so it's the opposite. The lower one is the pre-formed head, and the upper two are the peened head. I'm sure I'll get better as I go along, but these should hold! My biggest worry with the riveting is drilling through that steel tubing with #55 drill bit. It’s kinda scary. I'm afraid that the bit will snap any moment! And I'm going to be doing a LOT of these holes! Thanks for watching today's (somewhat boring) update! 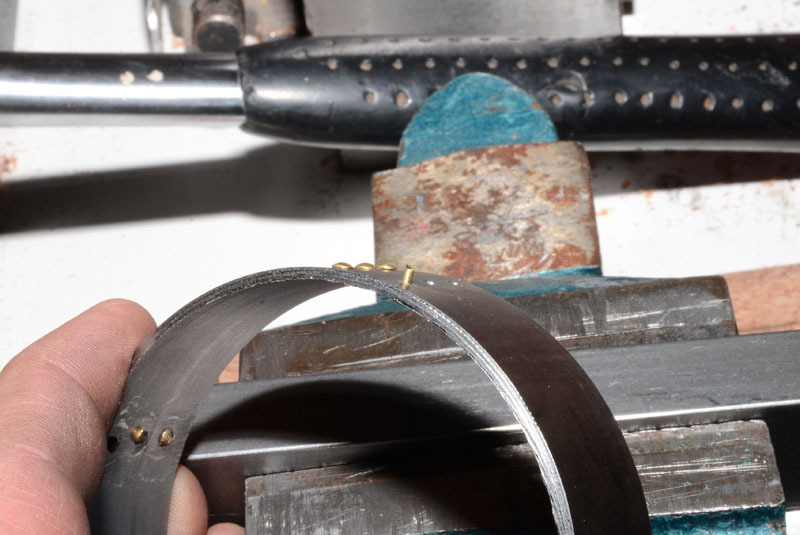 You may find it better to taper the end of the bottom snap away from the hole, particularly if using on the inside of the rim as you can see where it has brused the wheel rim. Also won't mark things if you have the work slightly tilted. Copper rivits are a lot softer and easier to set than brass, may be worth looking into those. 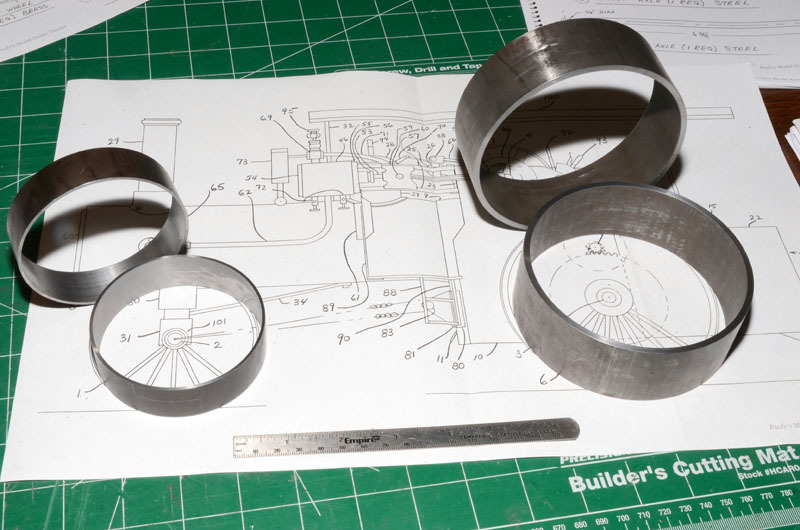 Hope this helps, having put over a 1000 rivits into my traction engine you get to know what works. Thanks for the advise Jason! I really appreciate it. The heads on these escutcheon pins are rounded, though not a full half round. And they are a little under 3/32" in diameter. I compared it to a 1/16" radius and it looked pretty close. I only went about 0.033" deep with the ball end mill, and felt it matched the curve and depth for the pin heads pretty well. Maybe I shouldn't have gone quite that deep. I'll definitely check again more closely. Yes, your right. I see those marks on the inside of the tube now. They're quite clear. I'll have to make another bottom piece and make it slope away from the hole so I don't get those marks! I thought about copper but the smallest ones I could find were way too big. And this seemed like a fairly good solution. It seems to be working. I will have to practice a bit more (obviously ). Still pretty worried about drilling hundreds of #55 holes in this steel. Guess I'll practice that too. And get more #55 bits to prepare for the inevitable! Good advice on placing the factory head too, thanks for taking the time to reply! Riveting is something I have never done either; part of my current project is going to require a number of copper rivets so I will be learning too. 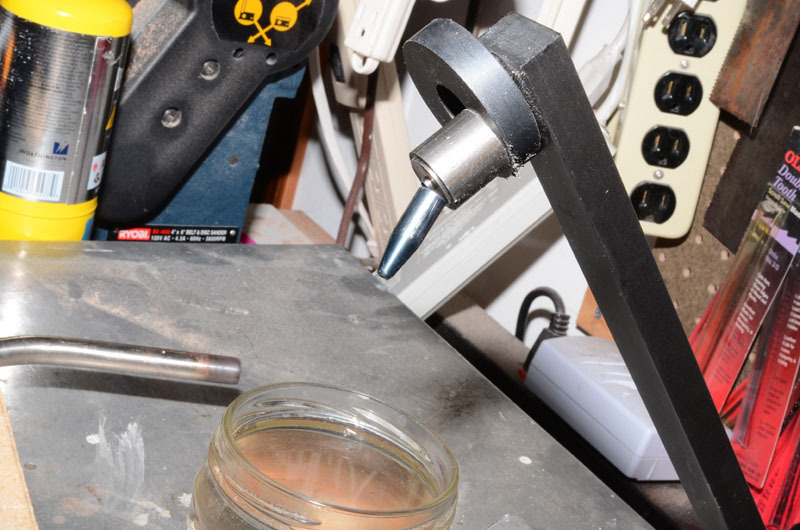 When you are heating your drill rod check it with a magnet; when the magnet no longer attracts your part is ready to quench. Sometimes on real small parts I just hold them with a magnet; when they fall off into the water they are done. On the tempering I think you may be way too hot here; polish the scale off your quenched part then heat it until it just starts to turn a nice light straw color. You can do this step in the oven which will have more control than the torch. Great work so far; looking forward to much more. The escutcheon pins are probably hard drawn and you may have better luck getting the head to form if they are annealed first. You may also need to play with the length to have just the right amount of material to properly form the head. Thanks for the pointers on the heat treating Dave. Yeah, i probably did go too hot on my tempering. I was reading somewhere that people generally go 'too cool' and I was trying to compensate (probably over compensate ). And who knows if they were right anyway! 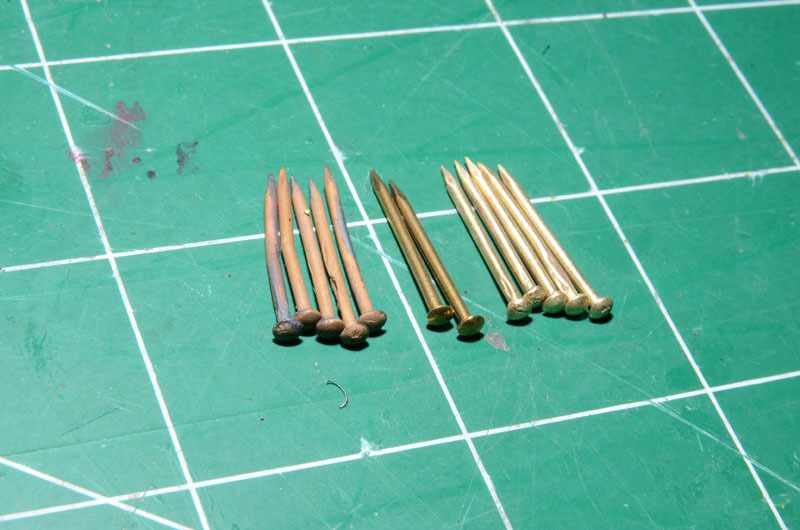 I was thinking about that too - annealing the pins before I tried to set them. I'll try that with my next set of tests and see how that goes - After I make a new anvil and try out the new tempering technique that is! Always so much fun stuff to learn! Welcome to part 2 of my riveting saga. 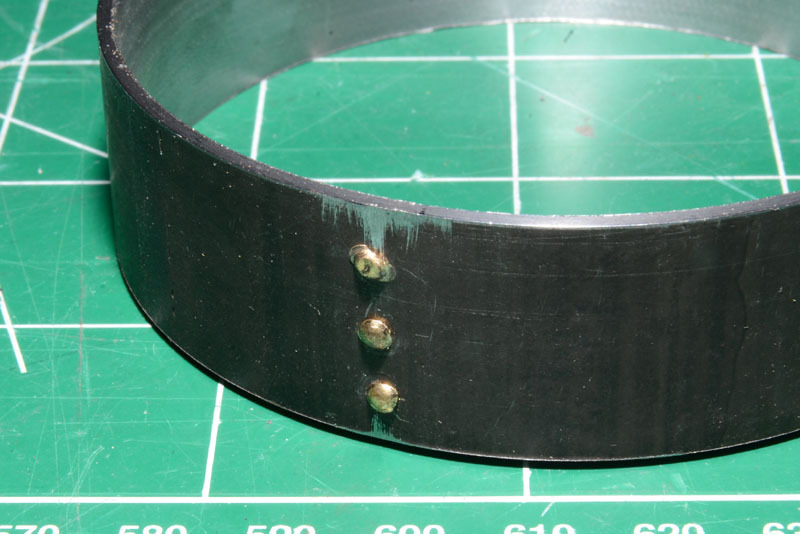 In this episode, I try to follow-up on all the excellent advice I have received from everyone regarding setting rivets. First thing was to check the shape of the heads of the escutcheon pins. And of course, Jason was right on. 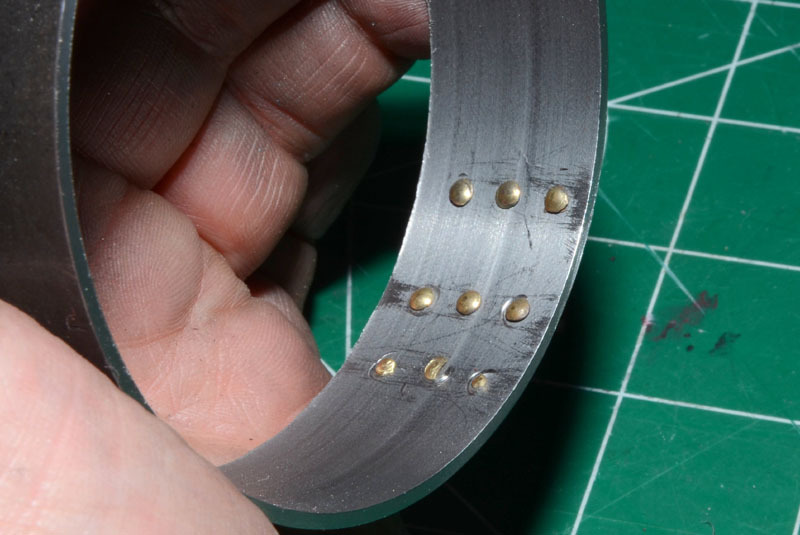 They don't match 1/8" diameter at all and they are quite shallow. I compared it to other ball end mills and it seemed to match a 3/16" ball end pretty close. So I made a new set of rivet tools. I made them less deep than the previous ones, to help prevent marring the material being riveted. I also made the anvil much more tapered for the same reason. The brighter ones on the left are the new pair. For heat treating this time, I tried Dave's suggestion of suspending the metal above the quenching water with a magnet. It seemed to work very well for the smaller part. This time I turned off my bright shop lights, leaving some dim background lighting, while I heated the part. It was much easier to see the glowing red. The part was a VERY bright red before it dropped into the water. That was pretty cool. The punch was another matter. My heat source wasn't big enough to get the whole thing THAT hot at the same time. So I settled for just hardening the business end of the punch, trying to judge the same brightness of red as the smaller part when it fell off the magnet. Then cleaned them up, getting rid of the ugly black scale off the parts before tempering. I've got a red-mesh wheel that I use for a very rough buffing and burr removal. Using this, I saw a LOT of sparks on the part of the punch that was tempered. But on the end that was not, I saw almost zero sparks. I hope this is a good sign. Once nice and shiny again, I went to temper the parts. I was going for that "straw color" I keep hearing about. And interestingly, I did see color change while heating. I can see why it's important to get the black off the parts for this!. Here's what I saw - is this "straw color"? If so, I'm afraid the tip end got too hot. But, when cleaning up the part after it cooled (slowly) I saw the same pattern of sparks on the end I'd tempered (or at least, tried to temper) and none on the non-tempered end. and went for it. That was harder than it should have been. As soon as I put the torch on them, the escutcheon pins went everywhere. I ended up doing them one at a time & using tweezers to pick them up and drop them in the water to quench. They turned red almost right away, if I could keep them in the flame. But they rolled around stupidly. If I'm going to do hundreds of these, I'm going to have to find a way to do a bunch of them together. 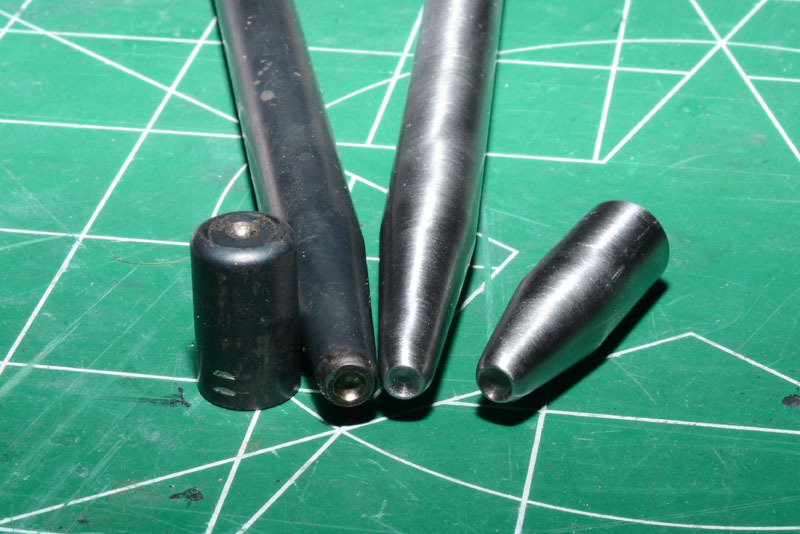 After annealing, the pins looked really ugly. Just to see what I could do, I took 5 of them and buffed them up a little. The five on the left are as they looked after annealing. The 2 in the middle are straight out of the package. 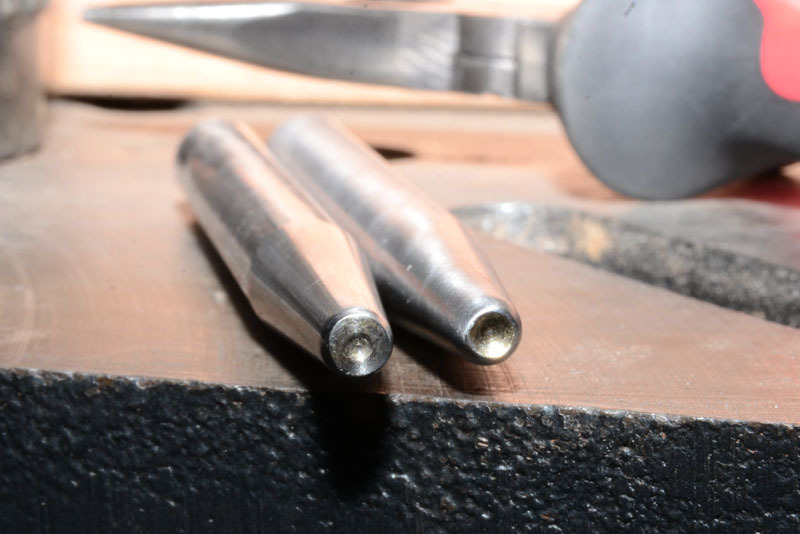 The 5 on the right are annealed and buffed. They still look different. Now to try out my new rivet tools. Drilling the holes went much easier this time. Guess what I did? I sharpened the #55 bit. BOY! What a difference that makes! I'm not as worried about that anymore (though, I'll probably still get a few extra #55 bits to have on hand just in case ). I also made a little countersink in the top side of each hole, as Jason mentioned. Here I've just inserted one of the annealed brass pins into its hole. And then nipped off the excess. This seems like 'about' the right amount to leave. I'm just trying to fill the countersink hole, not make a nice round head. 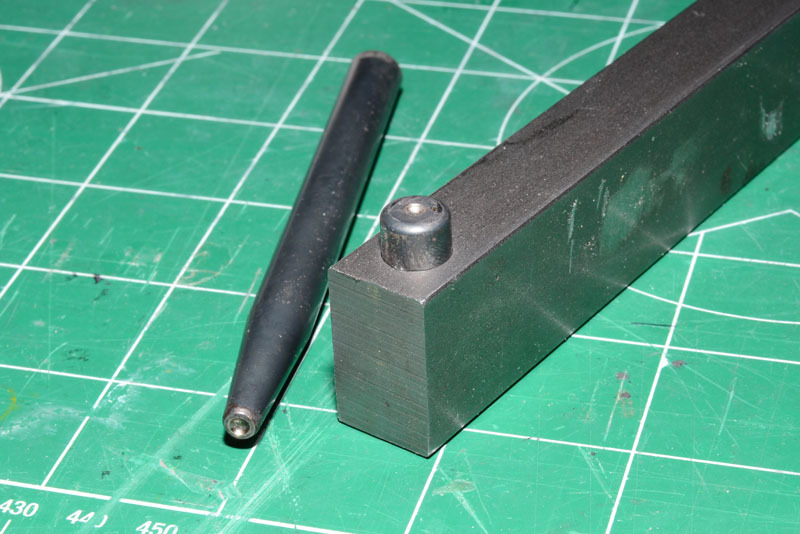 After trying a few, I realized that I needed a flat punch for when I don't want to form a rounded head. So I quickly whipped up another tool. 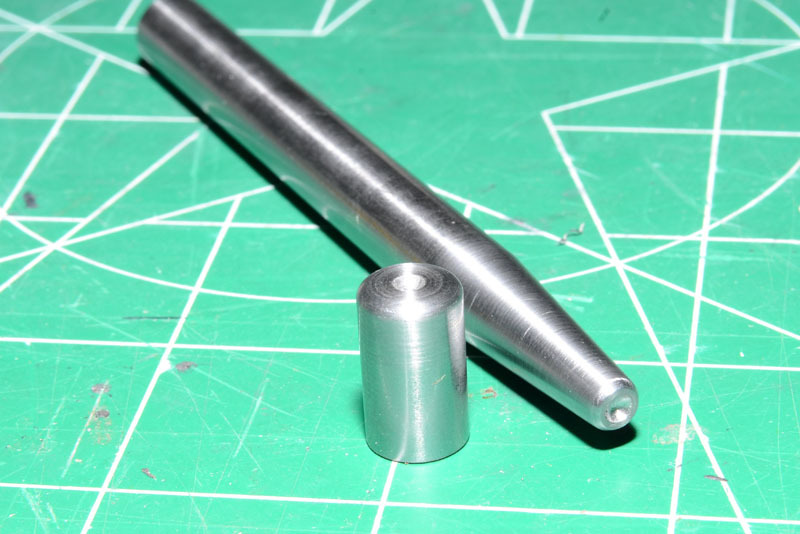 I did make a little pocket in the tip of the punch, just to make it easier to center and stay in place. But its VERY Shallow and small. Here's the two punches together. Head forming on the right, and flatish on the left. The row on the right was done with the factory formed head on the outside. The row on the left had the factory head inside. The top left one was done using the head forming punch. This is when I realized I needed the flater punch for these. The lower two were done with the flat punch. Here's the underside. You can see that the anvil is still marring the work a lot. So I ground a little bit off the anvil (and the punch tool also) to make the pocket a little more shallow (then cleaned & buffed it up). The top row in this picture is my latest attempts after making the anvil more shallow. Looks pretty good! On the top, I filed off the peened messy part to leave the part of the rivet that expanded into the countersink I drilled. I think I'm about ready for the wheel rivets. Kim you did a nice job on the punch and anvil. 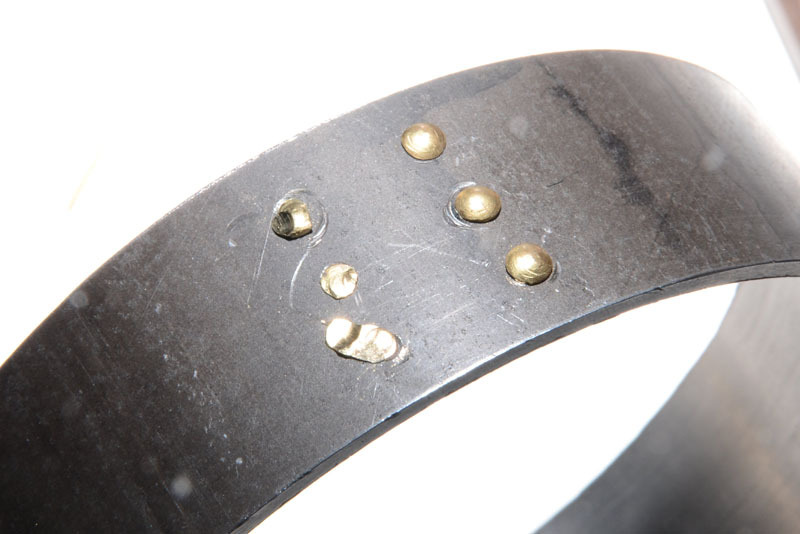 The rivets you annealed should not be dropped in water, just allow them to cold on there own. 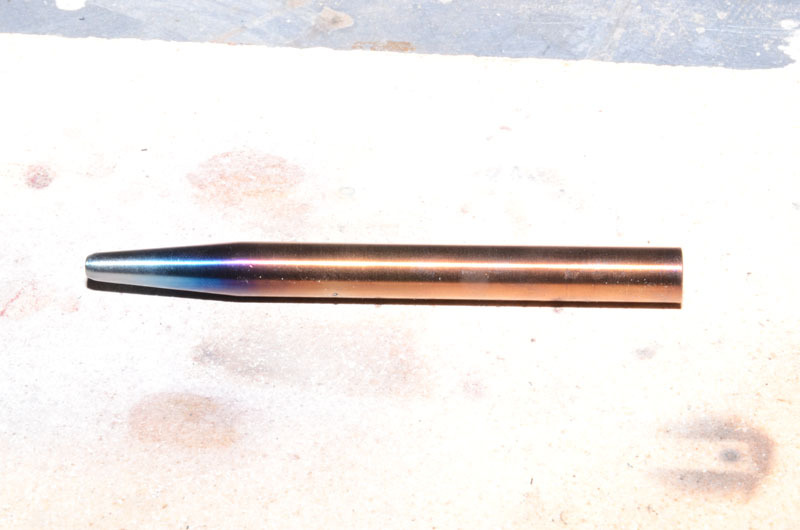 You are making great progress; when you anneal the pins you only need to get just a little color in them. Dim the shop lights and heat them till they just start to glow a very faint orange; then as Don has indicated let them air cool. Do a google search on the "color temperature of steel" you will some nice charts that give the temp vs. color; you will find that straw is about 430 degrees F.
Your time spent now will surely make your wheels and other riveted parts turn out much better; nice work! Thanks for checking in, and for the helpful pointers Don and Dave. I appreciate it! Copper, silver and brass can be cooled slowly in air, or quickly by quenching in water, unlike ferrous metals, such as steel, which must be cooled slowly to anneal. 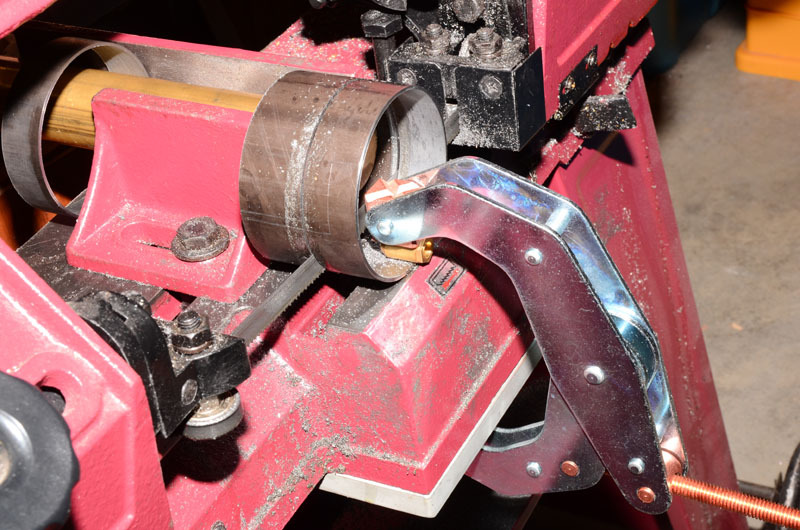 In this fashion, the metal is softened and prepared for further work—such as shaping, stamping, or forming. You can see the whole article here. The interesting thing here is that the cooler colors, this "straw color" is an oxidization color, not an incandescent color. I noticed that today when I saw it. But hadn't realized it before. This color chart confirms that in the foot notes. I supposed it was obvious to everyone else. I may be wrong but I really don't think it matters; quenching only speeds up the process. "Copper, silver and brass can be cooled slowly in air, or quickly by quenching in water"
So I guess it doesn't matter; just what ever you are comfortable with. Thats looking a lot better. 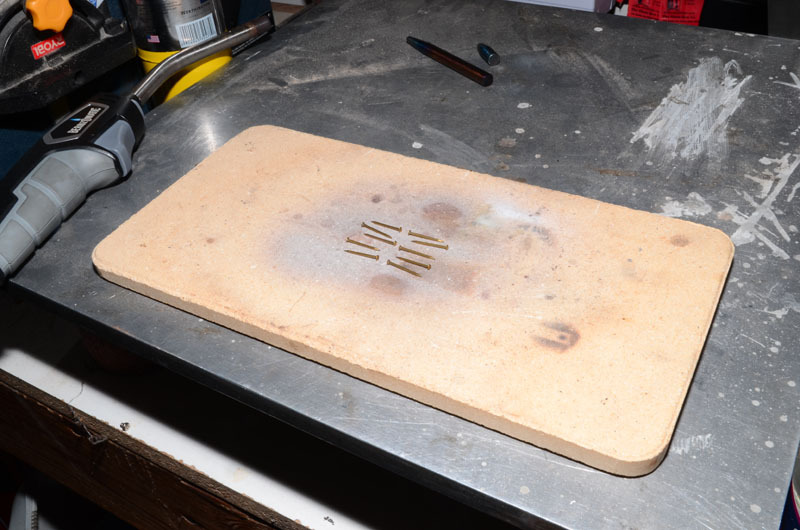 A small metal tin heated from below is an easy way to anneal a batch of rivits without sending them everywhere. You might want to get some acid do pickle them in after as that will remove all the discolouration and also good for taking scale of heated steel parts. Bad Behavior has blocked 16052 access attempts in the last 7 days.